Debra Ramirez of Texas A & M poses near the individual advanced western horsemanship pattern at 2005 IHSA Nationals in Sunbury, Ohio May 8th. Ramirez, who won team advanced western at 2004 IHSA Nationals, found herself in the winner's circle once again. Sunbury, OH - For the fifth season in a row the University of Findlay oilers could claim at least one blue ribbon in an individual stock seat class at IHSA Nationals, and for the first time ever the oilers could claim three separate individual stock seat undergraduate blue ribbons at a National show. The oilers can now claim seventeen individual undergraduate stock seat blue ribbons at Nationals shows since 1989, the most of any school since the IHSA introduced western in 1978. Findlay also boasted the IHSA's best Stock Seat Team for 2004-05, as well as the AQHA Trophy winner in Jake Bowman. More information about the AQHA Trophy class is available elsewhere on this site, while our coverage of the Stock Seat Team Competition will be posted soon. For the second year in a row IHSA Nationals was a four-day event, with english divisions usurping the entire opening day schedule. Day two of Nationals saw the first Stock Seat classes, with the rail portion of the AQHA class, two stock seat team classes, one alumni western class and the individual intermediate western horsemanship all taking place after lunch time. Intermediate western was the ninth out of twelve divisions held on May 6th, with sixteen riders qualified. Participation ribbons were presented to everyone at IHSA Nationals, so for each individual entry the goal was to place inside the top ten to earn an 'announced' placing. One by one the intermediate western riders took their turn, going through the pattern and then lining up at the opposite end from where they started. When the placings were announced tenth was awarded to Katie Weyenberg of Minnesota at Crookston, the lone undergraduate member of the golden eagle western team to reach Nationals. Jenna Lanzer was the only member of Wilmington College to reach Nationals in either discipline, earning ninth here. Trina Schwertner of West Texas A & M was eighth while John Steeves of Morrisville State College took seventh. In total contrast to many of the schools with only one or two individual qualifiers, Morrisville State had seven riders in six divisions! University of Maryland junior Kristin Deily earned the terps' best western ribbon at 2005 Nationals with a sixth while Nicholas Eisenbarth of the College of Southern Idaho (also known as the golden eagles) was fifth. Kansas State had a very large contingent at Nationals, including Valerie Meyer, who placed fourth. 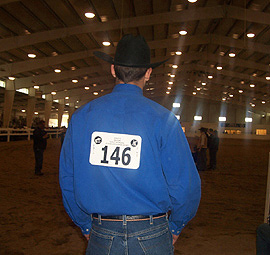 Stephen Chelko was not only the first Emory University stock seat rider to qualify for Nationals in the team's four-year history, he even managed to place third. William Brown, a senior from Washington, Michigan, nearly gave Findlay another blue ribbon but finished reserve in his final undergraduate ride. The blue ribbon winner was no stranger to the winner's circle, having won the team novice western horsemanship division two classes earlier in the afternoon. Fresno State senior Kayla Merritt won her second blue ribbon of the day and her third blue ribbon at an IHSA National show. The Quartz Hill, California resident was first in team intermediate western horsemanship at 2004 IHSA Nationals. Merritt, who was undefeated during the 2003-04 regular season at the intermediate level, graduates having never finished below first at a National Show and having been part of two Fresno State teams that placed third or higher at Nationals. The lone individual stock seat class on Saturday, May 7th was open western horsemanship. The seventh of nine classes held on this day started around 3PM in the afternoon and would be placed shortly after 4. During that time each rider walked, jogged and lopped before performing the pattern one at a time. 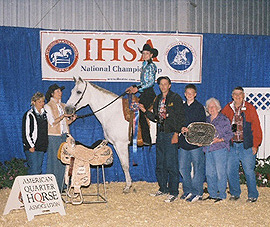 Eight of the sixteen riders were seniors, many of whom had ridden at IHSA Nationals at least once prior to the class. Surprisingly only six of the sixteen competitors were common to the 2005 AQHA Trophy class. Morrisville State sophomore Jennalinn Teel was the first of two mustangs to earn a ribbon in the open western, placing tenth. Kansas State junior Lindsey Hicks was ninth while Ohio State senior Rebecca Johnson placed eighth, ending a fine IHSA career which included a first in individual advanced western at 2003 Nationals. Sophomore Christina Ecker of Saint Mary of the Woods proved to be the most consistant western rider at 2005 Nationals, placing seventh in this division and again a few hours later in the AQHA Trophy class. Elizabeth Knapp of Fresno State was sixth but would improve on the placing the next day. Utah State's Alisha Smith was fifth while Oklahoma State senior Kayla Elmenhorst placed inside the top ten for the last time as an undergrad with a fourth. 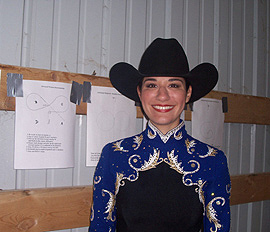 Though Zone 7, Region 2 is normally dominated by Texas A & M and Oklahoma State western riders, several other schools in this region advanced riders to Nationals in 2005, including Texas Tech sophomore Robin Morris, who placed third. Jacob Burger of Morrisville State had won the team open reining division last evening. This time Burger would earn the reserve ribbon. Earlier in the day the stars had aligned for Merritt; At 4:02PM they locked in on Jake Bowman. The Findlay senior from Dayton, Ohio captured what would be the first of three blue ribbons at 2005 Nationals, coming out on top in open western. At 8:37PM announcer Keith Bradley would announce Bowman's name again, as AQHA Trophy Champion. Bowman's third blue ribbon would be won on Sunday. The first, third, fourth and fifth classes on the Sunday schedule were all individual stock seat sections. For the only time in the four-day event the morning started with western and not english classes, with the first rider into the ring for individual advanced western horsemanship entering the ring at 8:23AM. There were only fourteen entries in the division, as no one in Zone 4, Region 1 had reached 35 points in the division during the regular season. As is the case in all individual and team western classes save for the Reining sections, each rider walked, jogged and lopped in each direction before lining up and performing the pattern for that particular division one at a time. A Morrisville State rider once again led off the announced placings as senior Patrice Hohl earned a tenth. University of Delaware junior Ryan Pepper was ninth while Murray State sophomore Jamie Gilmore earned the first of two top ten placings during the day for the racers with an eighth. Kansas State senior Melissa Becking earned the final individual ribbon for the wildcats with a seventh. Blair Markle earned what was likely her final ribbon as a member of the College of the Sequoias, placing sixth. The sophomore plans to transfer to Fresno State for the 2005-06 season. West Texas A & M senior Mallory Vestal, who was third in team advanced western at 2003 Nationals, was fifth. Vestal likely earned the last ribbon for the buffs as a member of Region 2, as West Texas A & M, Sul Ross State and Texas Tech will be moving into Zone 7, Region 1 to balance out numbers necessitated by Colorado State dropping their riding team at the end of the current season. Kristin Marchesi of Fresno State became the third of five bulldog stock seat riders to win an individual ribbon, with the junior placing fourth. Ashley Flick became the first North Dakota State rider to ever reach IHSA Nationals when she placed first at Zone 9 Zones on April 17th. The junior gave the bison their first IHSA Nationals ribbon with an impressive third. Ohio State sophomore Elizabeth Gombash took the reserve ribbon, but it would not be the last red one today for the buckeyes. Debra Ramirez, listed on the official Texas A & M web site as 'Debbie,' won the individual advanced western. A junior from Mission, Texas, Ramirez had won the team advanced western at 2004 Nationals and appears to be undefeated when competing at an IHSA National show. Left to right: Cazenovia's Kristin Lajeunesse, Fresno State's Elizabeth Knapp, Ohio State's Ashley Kovar and Findlay's Jake Bowman join IHSA Founder and Executive Director Bob Cacchione in the winner's circle following the conclusion of the NRHA open reining pattern. Perhaps no individual (or team) class receives as much attention as the Individual Open Reining. This is because the National Reining Horse Association sponsors the division, providing the winner with a new Tex Tan Saddle to go with the Morrison bronze reining trophy. The top four in the division also are invited to compete in "The Derby," held in Oklahoma City on May 20th, which essentially extends four rider's seasons beyond IHSA Nationals! Surprisingly only two of the sixteen riders qualified for the division this season competed in last years' NRHA class. Like the hunter seat jumper riders, Reiners receive an announced score following their rides. The horse draw determined the order of go, and Oklahoma State sophomore Katie Bohr became the rider to go first. Bohr scored a 136.5, which turned out to be one of the higher scores. Sixteen rides later (including two rides for Kate Hess of Southwest Missouri State, who received only the second re-ride of the entire show) the class was ready to be placed. However anyone who had been writing down the combined judge's scores of Ed Dingledine and Bonnie Jo Clay knew that there had been only one tie (and that was for two riders who overspun and received zeros) and that one of yesterday's winners was going to earn another blue ribbon. Earning tenth place with a combined score of 131 was Texas A & M senior Katie Forest. Though she still had a ride in the final class of the day (team open western horsemanship), some were sad to see the senior from Richmond, Texas earn such a low score. Good news is that Forest would in fact get to compete in the Derby, as she qualified through either her placing within the top four at the Varsity Equestrian Championships or through the application process, which fills the final four seeds in the Collegiate class (Forest went on to place fifth at the Derby - Editor). Ted Chapman of the University of Wisconsin at River Falls took ninth place with a score of 133.5 while Rusty Rea's final IHSA ride resulted in a score of 134 and eighth place. Rea was one of a handfull of riders who had competed at each of the past four IHSA National shows, having ridden for the University of Louisville 2002-04 before spending the last two seasons with Middle Tennessee State. Burger, who would be in the ribbons one more time in a team class, scored a 135 and seventh place. Another rider who could claim to have ridden at IHSA Nationals for two different schools is Brenna Burris of Fresno State. The former College of Southern Idaho standout earned her highest ribbon of the 2005 National show, placing sixth and having scored 135.5. Bohr was next, which would normally put her just outside the top four needed to secure a trip to the Derby. However, like Forest, the cowgirl from Holdrege, Nebraska applied for the opportunity to be one the final four riders into the division of twelve and went on to place eighth at the Derby. Cazenovia College senior Kristin Lajeunesse became the first 2005 Derby rider to qualify through IHSA Nationals, scoring a 138.5. Third place went to Knapp of Fresno State with a 141.5 score. The senior from Durham, California went on to place ninth at the Derby. Second went to Ashley Kovar of Ohio State, who received perhaps the nicest reserve trophy of the show. The NRHA presents a pewter trophy to the runner-up in this division. From Delta, Ohio, Kovar went on to place sixth at the Derby. Kovar had earned a score of 146.5, which put her one full point behind Bowman, who would still ride one more time in the team open western horsemanship division (where he earned his second reserve ribbon of the show). Bowman's third blue ribbon of the show had the oiler faithful hooting and hollering as loudly as at any time save for after the final class of the entire show, when the team awards were presented. Bowman led the field on this day with a 147.5 but would tie for third at the Derby with Morgan Strauss of the University of Georgia NCAA team. Strangely enough, the winner of the Derby was Colorado State's Shevin Schwartzenburger, who finished behind New Mexico State's Kelli Younker in the Zone 7, Region 1 stock seat open rider standings. Schwartzenburger was one of the four accepted to compete at the Derby via the application process. Though Schwartzenburger did not even reach Zone 7 Zones, Schwartzenburger did at least provide a nice ending to the storied history of the Colorado State riding program. Colorado State leaves the IHSA having won sixteen consecutive hunter seat Regional Titles (tied with S.U.N.Y. - Stony Brook and Centenary College for the all-time record) not to mention many individual National Champions, several reserve high point national champion hunter seat teams (most recently in 1999) and a tie with Texas A & M at 1994 Nationals for high point stock seat team (Younker, who was fifth in the AQHA Trophy Class, also participated in the Derby, placing seventh between Kovar and Bohr - Editor). Beginner's Luck: Saint Mary of the Woods freshman Calantha Bandy won the individual beginner western horsemanship class. This marked the first time ever that a Saint Mary of the Woods rider won an individual class at IHSA Nationals. From left to right are Head Coach Cindy Durham, Drew University Assistant Coach Sandra Sayre (who would need Bandy to sign for her saddle), Bandy and four members of the Bandy family. Beginner western horsemanship followed, with only fourteen entries as Zone 4 had no qualifiers. Though usually one of the quickest of the western classes at Nationals, the beginner division lasted about as long as most other stock seat rail classes. Tenth place was likely the final IHSA ribbon for College of the Sequoias sophomore Jamie Haynes, who will be getting married sometime this summer. Jamie Berning of Ohio State was ninth while Christina Carl came through with eighth place for Delaware Valley College. Placing seventh was Eric Mills of Salem International University, the lone Zone 6, Region 1 stock seat rider not from Ohio State to reach Nationals. One of the more unusual aspects of United States Military Academy junior Erik Johnson's sixth place finish was that one judge had Johnson in first place while the other gave Johnson nothing. Head Coach Peter Cashman thought the Monticello, New York resident had a good ride nonetheless. Like the West Texas A & M and Texas Tech riders who went before her, Stephen F. Austin sophomore Heather Sowers showed that riders from any of the schools in Zone 7, Region 2 can earn quality ribbons at IHSA Nationals, as Sowers placed fifth. Freshman Rachel Wesselman earned Murray State's highest placing at the 2005 show, taking fourth. Oklahoma State senior Allison Hufnagel saved a good ride for her last IHSA effort, placing third. Reserve went to Jeffery Miller of the College of Southern Idaho. This was the highest placing for any golden eagle rider at the 2005 show (team competition or otherwise) which was the final Nationals for popular Head Coach Curt Fuller. The only Head Coach in the seven-year-old Southern Idaho program history, Fuller decided early in the season to step down for personal reasons. Several of Fuller's former riders have made a mark elsewhere in the IHSA (Burris at Fresno State this season and Eric Hubbard as the University of the South Stock Seat Coach for the past two seasons being the best examples). It is unclear how long Saint Mary of the Woods College has had an IHSA team, though it is safe to say the 'pomeroys' have fielded a team at least back into the early 1990's. Known within Zone 9, Region 1 for a strong stock seat team (the pomeroys have won their region the past three seasons), Saint Mary of the Woods had never produced an individual national champion prior to 2005. Pomeroy freshman Calantha Bandy (who is also a hunter seat rider according to the official Saint Mary of the Woods web site) became the first Saint Mary of the Woods rider to win an individual blue ribbon at Nationals when the Sumner, Illinois resident took first in beginner western. 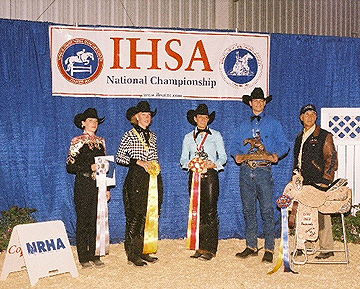 The next division was the penultimate division at IHSA Nationals, and also happenned to be the final individual class of the show. One of the sixteen entries in individual Novice Western Horsemanship who did not reach the top ten was Judson College sophomore Jennifer Hayes. Just for Hayes to compete was an accomplishment in itself. Hayes, who has only been riding stock seat for about two years, qualified for Nationals during Zone 5 Zones on April 9th. Perhaps a week later Hayes was involved in a head-on collision. "The other guy fell asleep at the wheel," says Hayes. "I have a broken rib, a torn ACL - maybe. I had my seat belt on. The other guy did not." Hayes spent time in the trauma center but had recovered enough by this weekend to compete at Nationals. "I had stitches removed on Wednesday," said Hayes (on a Sunday), thankful to compete even if still aching. 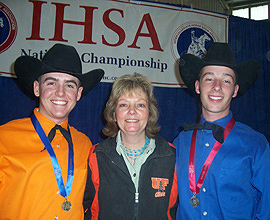 Findlay Stock Seat Head Coach Cindy Morehead (center) poses with oiler Novice Western Horsemanship riders Travis Womer (left) and Adam Smith (right) after both placed 1-2 for the third show in a row. Tenth place went to Lauren Vile, a freshman who stole the show for Delaware Valley College. Vile scored three of the aggies' four hunter seat team points with a fourth in team walk-trot-canter on Thursday, the lone Del Val stock seat team point in team advanced western horsemanship on Saturday (Heck, it gave them more western team points than Middle Tennessee State! - Editor) and another ribbon above participation level here for the school located in Doylestown, Pennsylvania (and not the state of Delaware as some may think). The Illinois fighting Illini had the second-best college basketball team in the country this season and the ninth-best novice western rider in freshman Kelly Herrington. Amy Simmons earned what would be the last Fresno State ribbon above the participation level with an eighth here. Kristin Dillingham, who had finished first for American University at Zone 4, Region 1 Regionals, placed seventh here. American teammate Lana Ciaramella was fourth at Regionals in the same division, but was the winner of a $1,000 scholarship which was presented at Nationals. Morrisville States' Brianne Good was good enough for sixth place while Georgia Southern sophomore Sarah MacKusick was the third of three eagle riders to compete (and the only one qualified for stock seat), placing fifth. Elayna Haan was the lone Black Hawk College rider in the top ten at 2005 Nationals, placing fourth here. Anna Quinn of Cazenovia College earned the wildcats' highest stock seat individual ribbon with a third. University of Findlay senior Jake Bowman prepares to collect another first place trophy. The senior from Dayton, Ohio won two individual classes, finished second (in a crucial situation) in a team class, and won the 2005 AQHA Trophy. With all the riders who technically placed eleventh through sixteenth excused before the top ten received their ribbons it was obvious to Findlay fans that the top two riders in the division were both going to be from their school. The only question that remained was if Travis Womer would continue his streak of blue ribbons. At Regionals Womer finished first while teammate Adam Smith was second. At Zones the top two remained unchanged. Bradley announced Smith as Reserve. "It's been this way pretty much all season," said Smith, a sophomore from Dobson, North Carolina. "He (Womer) keeps winning and I keep (getting reserve)." Womer, a sophomore from Camarilo, California, had perhaps won several consecutive novice western classes during the regular season before his three blue ribbons in the 2005 post-season, including the championship here. Findlay not only dominated the individual classes, but moments later clinched their second Stock Seat National Championship in five seasons. Bowman's second in team open western horsemanship (coupled with several riders from other teams placing out of the ribbons) gave the oilers 24 points and a come-from-behind win over defending National Champs Texas A & M. Save for the individual Beginner and Advanced Western Horsemanship divisions (in which no Findlay rider was qualified), the oilers placed a rider in the top five in every undergraduate stock seat class (team or otherwise) at 2005 IHSA Nationals. And save for a pair of fifth-place finishes in the team competition, all of the Findlay ribbons were reserve or better. Though the oiler english and western teams both prevailed as National Champions in 2001, the overall effort of the western riders - and the comeback in the team competition - may make 2005 the finest hour for Findlay stock seaters! Individual intermediate western horsemanship: 1. Kayla Merritt, Fresno State. 2. William Brown, University of Findlay. 3. Stephen Chelko, Emory University. 4. Valerie Meyer, Kansas State University. 5. Nicholas Eisenbarth, College of Southern Idaho. 6. Kristin Deily, University of Maryland. 7. John Steeves, Morrisville State College. 8. Trina Schwertner, West Texas A & M University. 9. Jenna Lanzer, Wilmington College. 10. Katie Weyenberg, University of Minnesota at Crookston. Individual open western horsemanship: 1. Jake Bowman, University of Findlay. 2. Jake Burger, Morrisville State College. 3. Robin Morris, Texas Tech University. 4. Kayla Elmenhorst, Oklahoma State University. 5. Alisha Smith, Utah State University. 6. Elizabeth Knapp, Fresno State. 7. Christina Ecker, Saint Mary of the Woods College. 8. Rebecca Johnson, Ohio State University. 9. Lindsey Hicks, Kansas State University. 10. Jennalinn Teel, Morrisville State College. Individual advanced western horsemanship: 1. Debra Ramirez, Texas A & M University. 2. Elizabeth Gombash, Ohio State University. 3. Ashley Flick, North Dakota State University. 4. Kristin Marchesi, Fresno State. 5. Mallory Vestal, West Texas A & M University. 6. Blair Markle, College of the Sequoias. 7. Melissa Becking, Kansas State University. 8. Jamie Gilmore, Murray State University. 9. Ryan Pepper, University of Delaware. 10. Patrice Hohl, Morrisville State College. National Reining Horse Association open reining pattern: 1. Jake Bowman, University of Findlay. 2. Ashley Kovar, Ohio State University. 3. Elizabeth Knapp, Fresno State. 4. Kristin Lajeunesse, Cazenovia College. 5. Katie Bohr, Oklahoma State University. 6. Brenna Burris, Fresno State. 7. Jake Burger, Morrisville State College. 8. Rusty Rea, Middle Tennessee State University. 9. Ted Chapman, University of Wisconsin at River Falls. 10. Katie Forest, Texas A & M University. Individual beginner western horsemanship: 1. Calantha Bandy, Saint Mary of the Woods College. 2. Jeffrey Miller, College of Southern Idaho. 3. Allison Hufnagel, Oklahoma State University. 4. Rachel Wesselman, Murray State University. 5. Heather Sowers, Stephen F. Austin University. 6. Erik Johnson, United States Military Academy. 7. Eric Mills, Salem International University. 8. Christina Carl, Delaware Valley College. 9. Jamie Berning, Ohio State University. 10. Jamie Haynes, College of the Sequoias. Individual novice western horsemanship: 1. Travis Womer, University of Findlay. 2. Adam Smith, University of Findlay. 3. Anna Quinn, Cazenovia College. 4. Elayna Haan, Black Hawk College. 5. Sarah MacKusick, Georgia Southern University. 6. Brianne Good, Morrisville State College. 7. Kirstin Dillingham, American University. 8. Amy Simmons, Fresno State. 9. Kelly Herrington, University of Illinois (Urbana-Champaign). 10. Lauren Vile, Delaware Valley College.